I haven't had so much fun for a long time! The Kick-Off trip was a blast! I came home with a cold (too much dancing + going outside to cool off) and the conviction that my colleagues are the best. I almost finished knitting Daisy on the bus on Thursday. I hadn't packed a backup project, so I went yarn shopping on Friday during free time. I bought 4 skeins of brown Idena Juvel, one of variegated Juvel and two balls of gold Filatura Di Crosa Brilla. The plan was to get enough yarn for Baby Bell Bottoms, but I couldn't resist the variegated for baby shoes and the Brilla for a skinny summer scarf. Ravelry rocks. I had queued the Baby Bell Bottoms, so it was very simple to use the public PC to check the yardage and print the pattern. I finished knitting Daisy on Friday after yarn store visit, and cast on for the Bell Bottoms on Sunday as the bus to Stockholm was leaving the Spa. I didn't knit very much because the cold was kicking in. Daisy, all ready for seaming. I made an effort to go to work on Monday, but had to leave early because I could not concentrate or even keep myself wholly awake. Tuesday and Wednesday were spent in bed, sleeping, and today I'm back to work. I missed the gym open doors day on Tuesday, but they have another next Tuesday also. I'll go then instead. 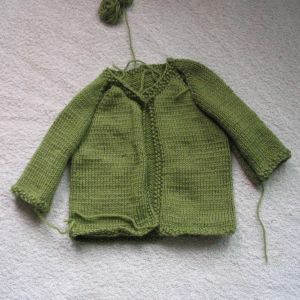 The baby was born yesterday and I'll be finishing the trousers, seaming the sweater and then blocking everything at double speed.